This smooth and fragrant sorbet came about through chance and is definitely one for the books. It’s as close to a vegan gelato as I get. I was making my typical vanilla sorbet with coconut milk for the dairy-free one, when I spied a sliced Bartlett pear sitting in lemon juice, leftover from a pear tart. So I pureed it and added it to the coconut milk mixture. The taste and aroma of the pear came through in the finished result. I served it with roasted pears sprinkled with tiny thyme leaves. A delicious combination! Blend the coconut milk with the sugar. Peel, core and slice the pear and toss with the lemon juice to prevent browning. Puree the pear and add it to the coconut milk mixture along with the vanilla. Chill the mixture thoroughly and process in an ice cream maker according to the manufacturer’s directions. Makes about 1 quart. Peel and core pears and cut them into 3/8-inch dice. Sprinkle them with a little brown sugar and roast them in a 400-degree oven for about 5 minutes, turning once. 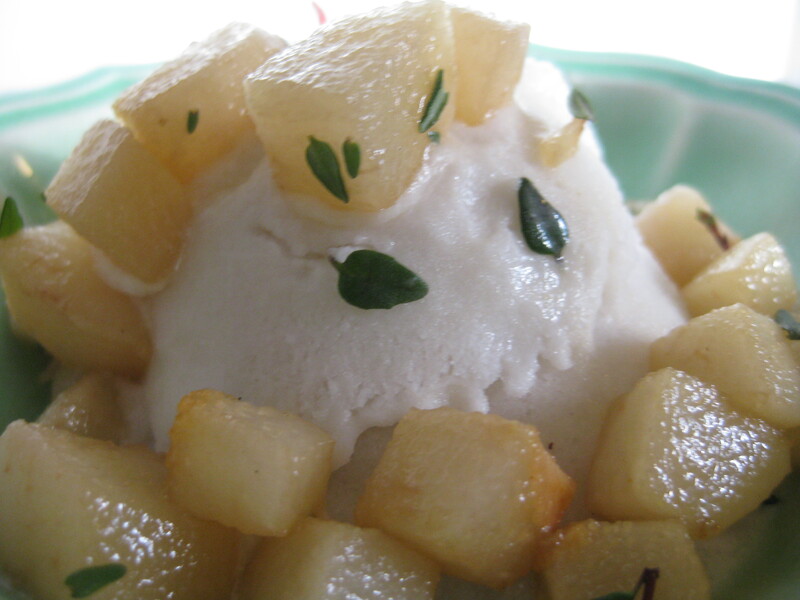 Everything, from the coconut to the roasted pears and thyme sound delicious. I’ll remember this one!